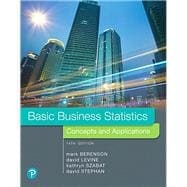 by Berenson, Mark L.; Levine, David M.; Szabat, Kathryn A.; Stephan, David F.
For one- or-two-semester courses in business statistics. Basic Business Statistics helps students see the essential role that statistics will play in their future careers by using examples drawn from all functional areas of real-world business. Guided by principles set forth by ASA’s Guidelines for Assessment and Instruction (GAISE) reports and the authors’ diverse teaching experiences, the text continues to innovate and improve the way this course is taught to students. The 14th Edition includes new and updated resources and tools to enhance students’ understanding, and provides the best framework for learning statistical concepts. Note: You are purchasing a standalone product; MyLab Business Statistics does not come packaged with this content. Students, if interested in purchasing this title with MyLab, ask your instructor to confirm the correct package ISBN and Course ID. Instructors, contact your Pearson representative for more information. Mark L. Berenson is Professor of Information Management and Business Analytics at Montclair State University and Professor Emeritus of Information Systems and Statistics at Baruch College. He currently teaches graduate and undergraduate courses in statistics and operations management in the School of Business, and an undergraduate course in international justice and human rights that he co-developed in the College of Humanities and Social Sciences. Berenson received a B.A. in economic statistics and an M.B.A. in business statistics from City College of New York and a Ph.D. in business from the City University of New York. Berenson’s research has been published in Decision Sciences Journal of Innovative Education, Review of Business Research, The American Statistician, Communications in Statistics, Psychometrika, Educational and Psychological Measurement, Journal of Management Sciences and Applied Cybernetics, Research Quarterly, Stats Magazine, The New York Statistician, Journal of Health Administration Education, Journal of Behavioral Medicine, and Journal of Surgical Oncology. His invited articles have appeared in The Encyclopedia of Measurement & Statistics and Encyclopedia of Statistical Sciences. He has coauthored numerous statistics texts published by Pearson. Over the years, Berenson has received several awards for teaching and for innovative contributions to statistics education. In 2005, he was the first recipient of the Catherine A. Becker Service for Educational Excellence Award at Montclair State University and, in 2012, he was the recipient of the Khubani/Telebrands Faculty Research Fellowship in the School of Business. David Levine, Professor Emeritus of Statistics and CIS at Baruch College, CUNY, has been a nationally recognized innovator in statistics education for more than three decades. Levine has coauthored 14 books, including several business statistics textbooks; textbooks and professional titles that explain and explore quality management and the Six Sigma approach; and, with David Stephan, a trade paperback that explains statistical concepts to a general audience. Levine has presented or chaired numerous sessions about business education at leading conferences conducted by the Decision Sciences Institute (DSI) and the American Statistical Association, and he and his coauthors have been active participants in the annual DSI Data, Analytics, and Statistics Instruction (DASI) mini-conference. During his many years teaching at Baruch College, Levine was recognized for his contributions to teaching and curriculum development with the College’s highest distinguished teaching honor. He earned B.B.A. and M.B.A. degrees from CCNY, and a Ph.D. in industrial engineering and operations research from New York University. As Associate Professor of Business Systems and Analytics at La Salle University, Kathryn Szabat has transformed several business school majors into one interdisciplinary major that better supports careers in new and emerging disciplines of data analysis, including analytics. Szabat strives to inspire, stimulate, challenge, and motivate students through innovation and curricular enhancements, and shares her coauthors’ commitment to teaching excellence and the continual improvement of statistics presentations. Beyond the classroom, she has provided statistical advice to numerous business, non-business, and academic communities, with particular interest in the areas of education, medicine, and nonprofit capacity building. Her research activities have led to journal publications, chapters in scholarly books, and conference presentations. Szabat is a member of the American Statistical Association (ASA), DSI, Institute for Operation Research and Management Sciences (INFORMS), and DSI DASI. She received a B.S. from SUNY-Albany, an M.S. in statistics from the Wharton School of the University of Pennsylvania, and a Ph.D. degree in statistics, with a cognate in operations research, from the Wharton School of the University of Pennsylvania. Advances in computing have always shaped David Stephan’s professional life. As an undergraduate, he helped professors use statistics software that was considered advanced, even though it could compute only several things discussed in Chapter 3, thereby gaining an early appreciation for the benefits of using software to solve problems (and perhaps positively influencing his grades). An early advocate of using computers to support instruction, he developed a prototype of a mainframe-based system that anticipated features found today in Pearson’s MathXL, and served as special assistant for computing to the Dean and Provost at Baruch College. In his many years teaching at Baruch, Stephan implemented the first computer-based classroom, helped redevelop the CIS curriculum, and as part of a FIPSE project team, designed and implemented a multimedia learning environment. He was also nominated for teaching honors. Stephan has presented at SEDSI and DSI DASI (formerly MSMESB) mini-conferences, sometimes with his coauthors. Stephan earned a B.A. from Franklin & Marshall College and an M.S. from Baruch College, CUNY, and completed the instructional technology graduate program at Teachers College, Columbia University.